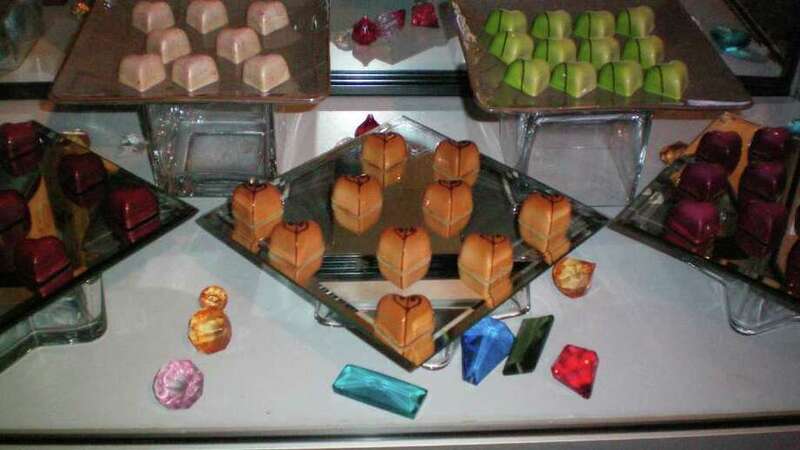 Jewel-like chocolates are created at Cocoa Michelle in Westport. Gentlemen, diamonds may be a girl's best friend, but don't even think about giving her some bling this Valentine's Day if there isn't some chocolate attached to it. Yes, roses are lovely. A romantic dinner is par for the course. But if you come home Monday with nary a truffle, don't say I didn't tell you so. Valentine's Day may be a "Hallmark" holiday, but it's the one time of year when it's acceptable -- practically required, even -- to splurge on chocolate. It's understandable, though, that you might need a little guidance navigating your way through the sugar sector. Have no fear. The following guide will help you find the perfect confection for your sweetie. In Fairfield Center, Sweet Rexie's is a combination of fun candies and decadent chocolates for the young and young-at-heart. It's heavy on the kids' stuff: foil-covered chocolate lips, gummy hearts, lollipops, mellow crème hearts and cinnamon gumballs. But Sweet Rexie's also has a nice selection of more sophisticated sweets, including its own signature truffles, which are made in Vermont. The flavors include black forest, champagne, tiramisu, amaretto, Irish crème and raspberry. "Our dark caramels with sea salt are a huge seller year round," said owner Nanci Lewis. Sweet Rexie's is one of the few places where you can pick your own assortment to put in a heart-shaped box, or you can simply pick up a pre-made one. In addition to candy, the store sells other tasty treats like caramel-filled, chocolate-covered waffles, chocolate-covered pretzels and champagne bottles made out of chocolate. There's more than just candy, too. You'll find stuffed animals, toys, mugs, cookies and all sorts of fun, colorful gifts. Parents of kids with nut allergies, take note: Sweet Rexie's carries Vermont Nut-Free Chocolates. For Connecticut-made confections, check out Munson's Chocolates in Westport. You can get sweets for the whole family here. There are Valentine's gummy bears and foil-wrapped peanut butter hearts for the little ones, Valentine vampire lollipops (chocolate hearts adorned with vampire teeth) for teens, and truffles and chocolates for your better half. They have more than 23 kinds of truffles, including margarita, mojito and shiraz-flavored, as well as "tipsy cherries" -- fruit soaked in port wine and covered in chocolate. You can pick your own mix of chocolates and Munson's will package them up in a plain box, or if you want a heart-shaped box, the store will have them pre-assembled. If you're looking to go a little more upscale, a little more "ooh-la-la," Fairfield's Isabelle et Vincent is the place to go. Chef Vincent Koenig hails from Alsace and received his master's diploma as a pâtissier, confiseur and Glacier. In other words, he makes exquisite hand-crafted, fancy chocolates. And lastly, there's Cocoa Michelle in Westport. It takes a second, maybe even a third glance to make sure you're really looking at chocolates and not jewels. Each piece is gorgeous, glossy and painted in exotic colors. Here you'll find flavors like cinnamon caramel, mint, blood orange and champagne raspberry, as well as paprika or curry. However, the dark chocolates with sea salt remain the most popular. "Even though our customers have a sophisticated palate," said Jeffrey Sherman-Thompson, chef-in-residence, "the classics still seem to resonate." You won't, however, find any heart-shaped boxes here. One gets the feeling that that's a bit too -- shall we say, conventional -- for Cocoa Michelle. Instead, the treasure-like chocolates are tucked into Tiffany-style blue and brown boxes or little blue Chinese take-out containers. Of course, in the end, there's always the local drugstore, where you can get a big, shiny, red heart filled with chocolates, a bag of Conversation Hearts and a goofy card with lots of Xs and Os. After all, it's not really the chocolate that makes her heart all aflutter. But it sure doesn't hurt. E-mail Patti Woods at eatdrinkshopcook@gmail.com. Sweet Rexie's: Got kids? Go here. 1552 Post Road, Fairfield. 203-254-3254. Munson's: Kids? Check. Wife? Check. Chocolate-covered pretzel for yourself? Check. 1460 Post Road East, Westport. 203-259-6991. Isabelle et Vincent: Happy Valentine's Day, mon petite chou chou. 1903 Post Road, Fairfield. 203-292-8022. Cocoa Michelle: Voulez-vous coucher avec moi? 54 Railroad Place, Westport. 203-221-0020.